The chat is in the bottom right corner! 1: be respectful - no mean ponies! 2: please don't spam or advertise. 3: all general forum rules apply. Talent/Profession: Rarity's talent is making beautiful clothes for both mare and stallions. She also has a keen eye for decorating and picking out jewels. Rarity owns a clothing shops where she makes clothes for the citizens of ponyville and for ponies from different cities across the country. The shop is called Carousel Boutique. Cutie Mark: Is three light blue diamonds. Powers: Rarity posses basic unicorn magic like levitation. She mostly uses her magic when sewing clothes. She also knows a spell to help her find jewels. She's also posses the element of generosity. Rarity is medium size pony with a slim body. She has white body and so is her horn. Rarity's mane and tail are dark purple. Both her mane and tail our curled and are bit poofy. She has light blue eyes and wears blue eye shadow. Her eyes have long eye lashes which are fake. Rarity is a very elegant unicorn. She always acts like a lady and wants other ponies to treat her like one. She has very good manners and always is always polite which also her to easily charm stallions. Rarity speaks very formally and tends to use higher vocabulary. She always gives attention to little details. For example in the sleepover episode Rarity was caught up in making the trees' leaves look pretty instead of getting them ready for a huge storm. Another example is in the winter wrap up eisode where she focused all her attention on fixing Twilight's bird nest instead of working on the other bird nests. Rarity cares a lot about beauty and appearance. She makes sure her mane and tail look good and is clean. She hates to get dirty. Rarity also worries about her friends' appearance as well. For example when she first met Twilight and saw her main and tail were a mess. She quickly took her back to her shop to give her make over. Rarity loves being in spotlight and always try to sell her clothes to the bigshots. Rarity can also be a bit of drama queen. She sometimes takes thing way too seriously. Despite her girly ways Rarity can take care of herself fairly well. For example when she got kidnap by dogs, she was able to annoyed them with her whining. Finally, Rarity is very generous. She cares deeply for her friends and her little sister. A good example is in the art of the dress episode where Rarity offer to make a special dress to each of her friends for the Gala. Rarity was born and raised in Ponyville. Since she was a very young filly Rarity has been into fashion designing. One year in grade school Rarity was in charge of her class's costumes for their school play. During a practice performance Rarity's teacher made a comment that her costumes she made looked nice. Rarity was upset by this comment and went home to change the costumes. She was in artist block and started to question her dream of becoming a fashionesita. Suddenly her unicorn magic dragged her to the outskirts of Ponyville. It led her to a giant rock which made Rarity quite upset. The suddenly a giant boom and light occurred and the rock opened up and raveled jewels. Rarity then took the jewels back home and added them to the costumes. At the play that night her teacher commented that her costumes were wonderful. Rarity was pleased with her comment and suddenly her cutie mark appeared. 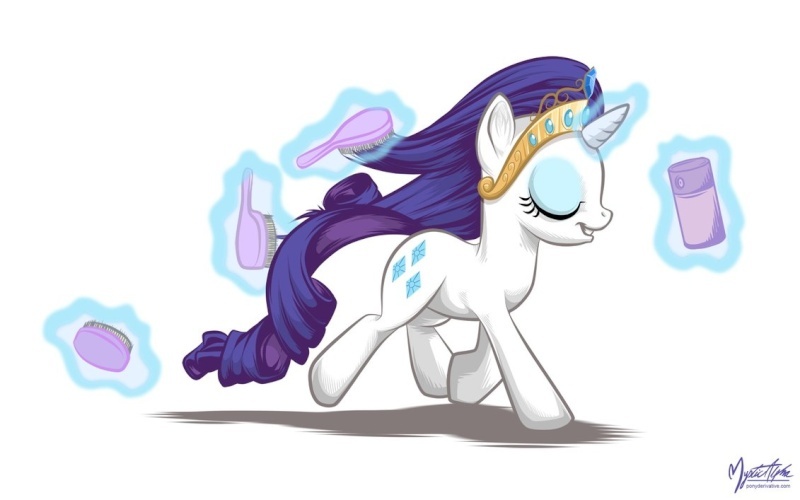 Rarity then her true calling was a fashionesita. As she grew older she opened up a shop inside of her home called Carousel Boutique. A few years later Rarity met Twilight Sparkle and helped her quest to stop Night Maremoon along with Pinkie Pie, Fluttershy, Rainbow Dash, and Applejack. After defeating Night Maremoon, the six girls became close friends. Later that year the girls had to band together to defeat Discord from creating a chaotic Equestria. Rarity had to help Equestria once again when Canterlot was attacked during Twilight's brother wedding. Rarity was caught up in designing her brother's bride's wedding dress that she didn't notice that the bride, Cadence was acting strange. Rarity like the others didn't find out the truth about Cadence having an evil double until after real Cadence and Twilight crashed Twilight's brother's wedding. Rarity then joined Twilight and the other mane 6 to defeat the evil Cadence double (too lazy to look up her name). After the wedding between the real Cadence and Twilight's brother, Rarity goes back home with her friends. A few months later Princess Celesita calls upon Rarity and her friends to go to the Crystal Empire to help Crystal Ponies who vanished for many years. The girls traveled there and helped Cadence and Twilight's brother to defeat the evil stallion Sombre and free the Crystal Ponies from his suppression. Several months after those events Rarity was shocked to hear about the death of Princess Celesita. She was in denial for a bit because she loved her princess very much. She then heard from Princess Luna that Twilight will be the heir to Celesita' throne. At first Rarity did not want her friend to take on such a duty, but she respect Twilight's decision and supported her. After Twilight took the throne, she asked Rarity to be her fashion consultant. Rarity quickly agreed and moved her shop to Canterlot so she could be close to Twilight. Sweetie Bell is Rarity's younger sister. The two are quite close, but at times they do argue due to their differences. An example for their difference is Rarity clean and proper while Sweetie Bell can be quite messy. Rarity's parents (the show has no names for them) have a very care free attitude. Opalescene is Rarity's pet cat who can have a feisty attitude with Rarity. Sometimes Rarity has Fluttershy care for her. Rarity is quite found of Spike. She thinks he's cute and sometimes calls him Spikey Wikey. Sometimes she asks Spike to help her look for jewels. Title : Hollywood Pirate Queen In Space!! One thing, this takes place just after the events at the crystal kingdom, so more like months not years. Celestia and Luna only had 2(2 1/2) years together before Celesita dies. other than that it's great! Siggy and avie by Dash! Yeah, I wasn't sure how many years has past between the seasons so I made things up. I can fix it. Alright once that's fixed you're approved! Did it! :) I bolded the change!